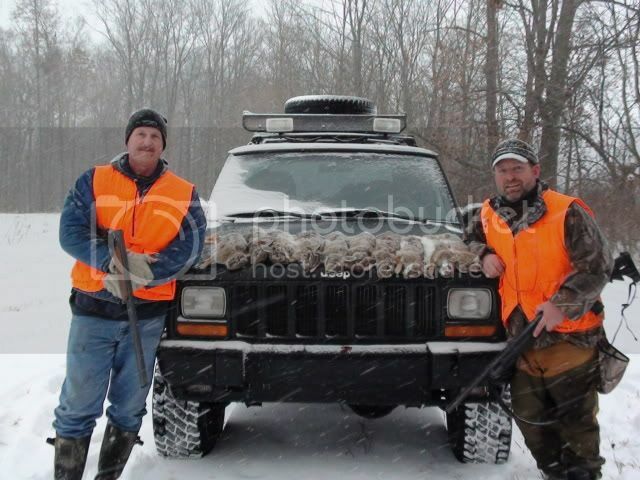 After a couple dismal morning bunny hunts with my friend Ken, we decided to try the afternoon. We went to my Uncles place where I've had good luck in the past. The snow started to fly when we got out at 245 pm, but it didn't damper our spirits, although I was unable to video tape. we got our limit of 5 each by 5 pm and we earned it, a lot of walking but seeing and getting the bunnies made us old guys energized. we ended up getting 10 out of 11, and the one I missed I actually hit but it got away, just knocked off some hair. I hope you're the one with the shotgun sans sling. REAL MEN don't put slings on shotguns! I put the sling on so when I video tape I can slide sling my gun and carry the tripod , it was snowing pretty good so I ended up not video taping. Nice score! It's pretty hard to beat fried rabbit! I am partial to Hassenpfeffer, but do also like fried rabbit, just put some salt and pepper and a little paprika in some flour and a hot buttered iron skillet ! !